Make or Drake: Is Uncharted 4's Multiplayer beta fun? My digital avatar's body is riddled with bullets, but I'm not dead; at least not yet, anyway. I'm crawling around like an energetic infant, desperately searching for a teammate to bring me back to life. I press X on the PS4 controller to cry for help, but my pleas go unanswered. Instead, my techradar colleague Stephen - here my nemesis on the opposite team - runs over and violently kicks me in the head. My avatar crumbles to the ground, now a digital corpse. I wait to respawn. This is our early hands on with the multiplayer beta of one of the PlayStation 4's most anticipated exclusive titles, Uncharted 4. While the Uncharted games are best known for their highly cinematic single player adventures, developer Naughty Dog has put a lot of effort into creating a unique and appealing competitive multiplayer experience. Stephen and I spent an hour going toe to toe, in the lead up to the multiplayer beta's launch. Here are our early thoughts. Nick: Let's kick things off with you apologising for finishing me with a knee to the face Slams. That was brutal. You could have just left me crawling around like a child, desperately seeking sanctuary, until I bled out or voluntarily respawned. I must say, there's a perverse satisfaction that comes from finishing off a downed enemy in Uncharted 4's multiplayer. It's almost comical seeing your opponents crawling around in such a helpless manner. Less funny when it happens to you, though. You can either crawl on all fours like an idiot and hope that someone on your team will come and save you, or take easy way out. In over an hour of play, however, I was rescued by a team member only once. Health escapes you rapidly, and there's no real incentive for someone to risk their life saving yours. It was almost ridiculous how often an entire team could be reduced to infant status. Stephen: One interesting new mechanic involved the ability to swing across chasms with a well-thrown rope and hook combo. This added a new dimension of movement to the standard run-and-gun multiplayer gameplay seen in previous games. Nothing feels more glorious than a perfectly-timed swing into battle. Nick: One of the maps we played on made the grappling hook a central component to moving around, and it was pretty refreshing to be able to swing across chasms to get away from enemies. The only problem was that it leaves you completely defenceless against enemy fire – It's hard to hold onto a rope when your torso is being filled with bullets, I guess. But the other map we played, the grappling hook was a minor component. There was a section of the map that allowed you to swing across the top of buildings, but it wasn't all too common to find any enemies over there, so it went underused. Stephen: A similar mechanic is employed in Rise of the Tomb Raider, which I've been playing a lot of lately. Because of this, the new swing mechanic felt like second nature here. Nick: One thing I did get comfortable using eventually was the powerups. As you kill enemies and "find treasure" in each match, you earn cash you can use for powerups to try and give you an advantage. Throwing some mystical totem into a crowd of enemies was a good way to rack up the kill points quickly, although more often than not my attempts didn't take out as many enemies as I'd hoped. Did you manage to master the magic? Stephen: I got used to it after a while, though I kept forgetting it was there. Admittedly, I wish the powerups were mapped to the Dualshock 4's d-pad, rather than having to press the touchpad to bring up a separate 'purchase' screen. It feels like an unnecessary step that impedes you in the middle of battle. I quite like how you have to earn money in order to buy single use powerups throughout matches. It gives you a real incentive to proactively attack members of the other team. The more knockdowns and kills you get, the richer you become. That said, there were several instances where I dropped a whopping $800 on a temporary sidekick, only for him to be killed by the other team only seconds after arriving on the battlefield. Needless to say, it was flushing virtual money down the digital toilet..
Nick: I think you're right about the button mapping. After a couple of times of ordering the "mystical" powerup, that magically sucked life from enemies after I threw it with R1 and L1 together, I tried to buy the sidekick. Problem was, while the mystical powerup lets you buy it and store it for later use, the sidekick purchase was immediate. That would have fine, except it spawned over on the side of the map where there were absolutely no enemies, and so was effectively a wasted purchase. I don't really think I managed to explore the powerups to their fullest in the hour or so session we played, but I did like the idea of mixing up the old generic multiplayer shooter. I've spent a bit of time recently in Star Wars Battlefront, and while it's been fun for the Star Wars fan in me, the gameplay itself hasn't really lit my sabre, so to speak. And I kind of feel the same about the Uncharted Beta. I definitely had fun in that hour of gameplay, but I walked away with one burning question: Why? Uncharted is an amazing single player adventure, and I can't wait to go back and explore the world as Nathan Drake again. But does the game need multiplayer? Are these unique takes on competitive shooters enough to turn Uncharted from a single-player masterpiece to a multiplayer leader? Stephen: I have to agree. 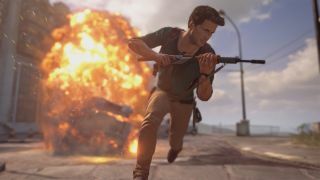 To me, the best parts of the Uncharted series are its characters and exploration – two aspects that are far from anything competitive multiplayer has to offer. It also doesn't help that Naughty Dog has yet to hit the sweet spot when it comes to Uncharted's gunplay. Four games into this series (five if you count Uncharted: Golden Abyss on PS Vita) and it's still somewhat dreadful. Too often during matches I found myself hitting L2 to aim at an opponent only to end up wildly off-target. If a multiplayer shooter can't get its aiming right, why would I want to stick with it in the long run? Sure enough, the mode's got its moments of fun, but only the most diehard of Uncharted fans are going to want to stick with this. Personally I don't see this multiplayer mode dragging me away from Destiny, Battlefront or Black Ops III any time soon. With that said, I can't freakin' wait for the single player campaign! Nick: Definitely. On the upside, this is only a beta, so there's still plenty of room for improvement with the aiming mechanics. Naughty Dog will also hopefully add the ability for me to drop a grenade the next time you go to finish me off, so I can take you with me into respawn city. Will Uncharted 4 join the list of the best PS4 games?